No Contact (Fouling): Non-incidental contact between opposing players that impedes the ability to catch, throw or run freely is a Foul. If a player was fouled while they were in the act of throwing, the disc is returned to them unless the pass was completed anyway; in that case the team may play on ‘through the foul.’ If a player was fouled when receiving the disc, give that player the disc where the foul occurred. Ask a student or pair of students to demonstrate how one player marks another who has the disc. Bend the knees of the body low, feet about shoulder width apart, arms out, stay on the balls of the feet and balanced. Shuffle or slide, in anticipation of the thrower, in a way that makes his or her throws more difficult. Catching/Throwing with Marker Game (4 Students): Practice throwing while marked; and marking a thrower. Two groups of two students about 15 yards apart. Take turns and switch being the thrower and the marker. Thrower tries to fake, pivot, step out and throw around marker. If marker fouls the thrower, thrower may call ‘foul!’ – they get the disc back to try again. Show Cutting Defense: A few examples of one player cutting for a disc with a defender covering. Have two players stand in an open space while others stand aside. The player on offense has 3 seconds to run wherever they want, including changing direction (cutting). The player on defense tries to block or intercept a pass thrown shortly after. 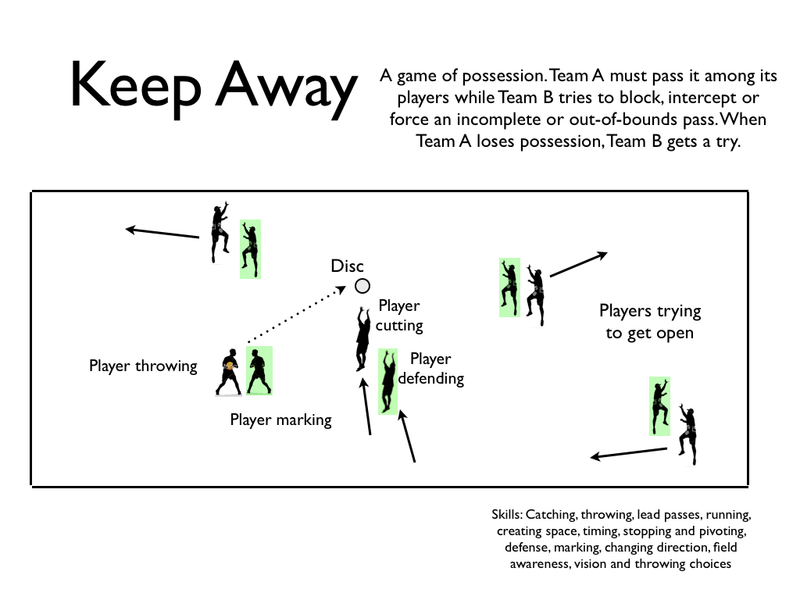 Possession and Defense: One team possesses the disc while the other tries to interfere. The task of the defense is to force a bad pass that goes out of bounds or is thrown to the turf; to get a block so the disc is not caught; or to get an interception outright. Keep Away Game: Establishing and keeping possession over multiple passes within a limited field boundary. One group gets to possess the disc within the limits of the field. Pass among their teammates while the other group defends them person-to-person. If there is a turn over, the other team may pick it up and begins their own possession. Each group counts its highest number of consecutive passes that it can manage before being blocked, intercepted, forced out of bounds, etc. The group with the highest consecutive pass count, given equal chances, wins. the instructor should seek to have the students themselves officiating the game by the end of this lesson.